Welcome to my porch. It’s been a while since I remembered to say “howdy”! It is raining as I talk with you now but some times that is a favorite time for me to sit outside and watch the rain fall. OK. I’m easily entertained, what can I say? I admit it. I’m a Maxine groupie. 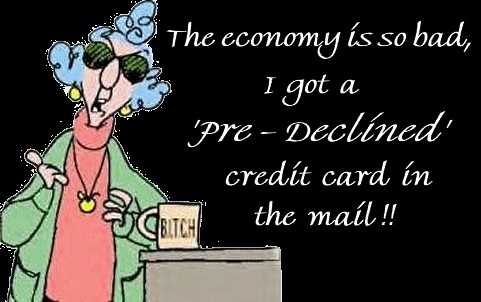 The same friend who sent me the video yesterday also sent me the following Maxine cartoons. I’m afraid I don’t know that much about copyright laws. I guess if I’m going to have a blog for any length of time I’d better find out. 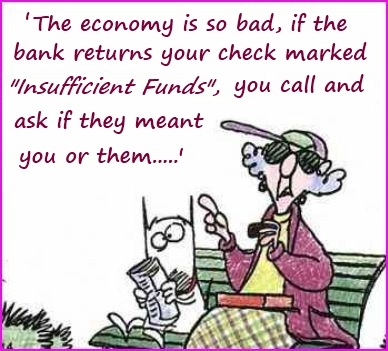 I get cartoons in emails all the time. Is it OK for folks to send them in emails? Is it OK for me to use them in my blogs? 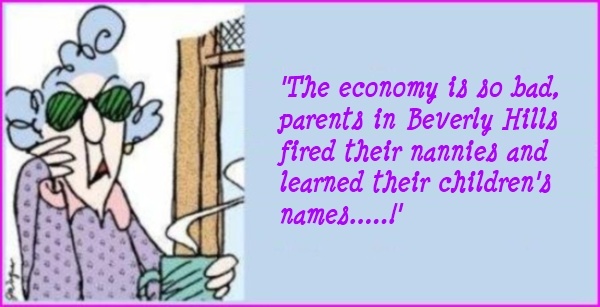 It’s obvious I am not the creative artist who produces Maxine. If I use any of his images in my blogs, am I supposed to credit him even if I do this free of charge? No one has given me a penny for my thoughts as of yet. If I am to credit him then here is his credit. There, hopefully that will take care of that issue. 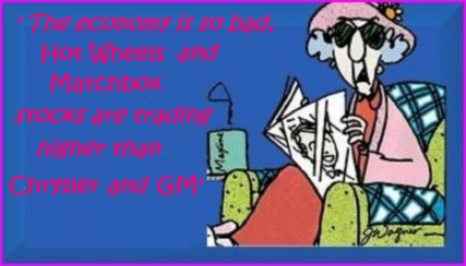 Everybody knows the economy is bad. Actually, we are told so many times a day in so many ways, I think perhaps it is time to get some comic relief going in this situation. I can say that because I haven’t lost my home, I managed to bail out of the stock market with my IRA not completely wiped out…seriously wounded, I will admit. I am managing to still live rather frugally on my teacher’s pension. (I am not a high maintenance person. If you knew me you would readily acclaim that is an understatement. )So therefore, in spite of the misery around me, I can see some humor in our situation. The artist also sees humor…and unvarnished truth. I appreciate people who tell it like it is. 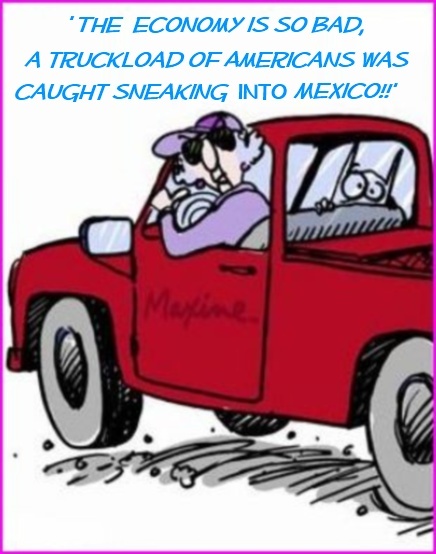 And, thanks to Maxine, he does. 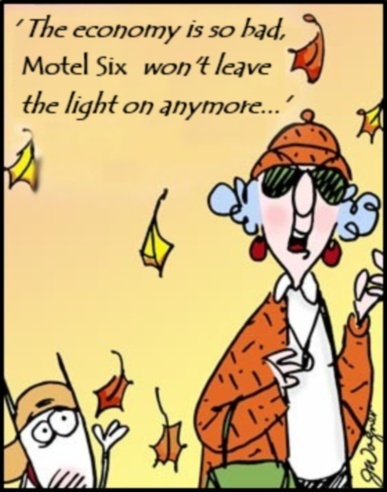 For those of you who haven’t been following my blog, the neighbor who lives across the street is the spitting image of Maxine. I talk about her every so often in my blog. She also tells it like it is. I wouldn’t have it any other way. I love her dearly. She is like the sister I wish I had. If I could, I would take a picture of her and post it on my blog. It would be difficult for you to tell which picture was the real one. 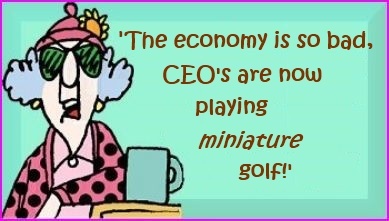 The economy is so bad. It will remain bad for quite some time. But at least there are some around who specialize in helping us discover for a few moments that if we are unable to laugh at this time in our lives, at least we might be able to smile a little. 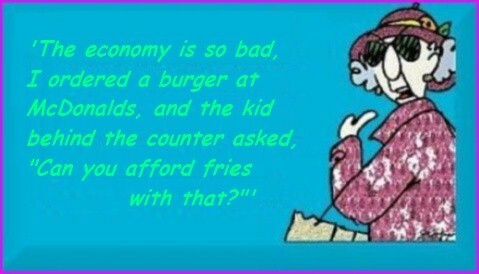 Did you know the economy is THIS bad? 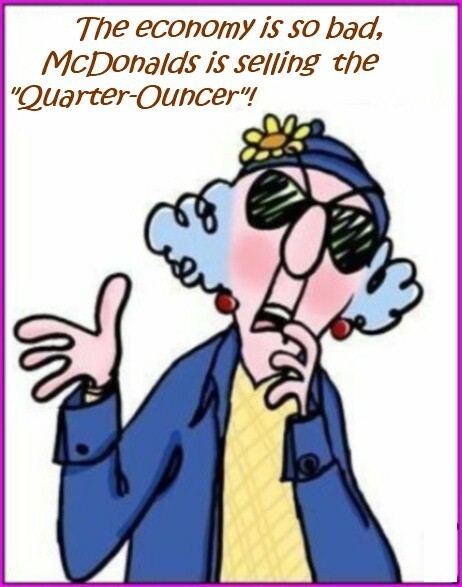 I hope Maxine makes your day. Sometimes it is the artists, writers, and poets among us who help us see situations like they really are. They can make true statements (generally) and it is protected under the Constitution…at least if the artist lives in America. Happy May Day, Mrs. Goetze! Happy May Day Mrs. Goetze! Once I left my neighborhood to attend college, I revisited my childhood neighbors fewer and fewer times. I was gone three years before I returned home to finish my college undergraduate work my senior year at a local college. Some time during those three years I think I can remember someone mentioning that Mrs. Goetze had died, but I can’t remember exactly when. At that time she was really no longer in my life. Mrs. Goetze and her husband lived across the street from me. From a child’s point of view she was always “old”. Mrs. Goetze loved little children. I think she had children of her own, but if she did, they were already gone from the house by the time I was old enough to remember them. I vaguely remember her husband, but he passed away when I was pretty young. She continued to live there by herself. From time to time I try to think about what I remember about this woman. I remember several Halloweens when hers was the best house to visit. She invited us into her kitchen for her homemade goodies. One year it was taffy apples. Another year it was popcorn balls.I think I remember cookies. She exuded love and caring.To a motherless little girl, she meant a lot to me. I remember spending time with her. I visited with her in her home while she did her daily chores. She hung her wash on lines behind her house. I helped her gather in the dried clothes. She had one of those pull-down ironing boards in her kitchen. I sat at the table, and she talked to me while she ironed. 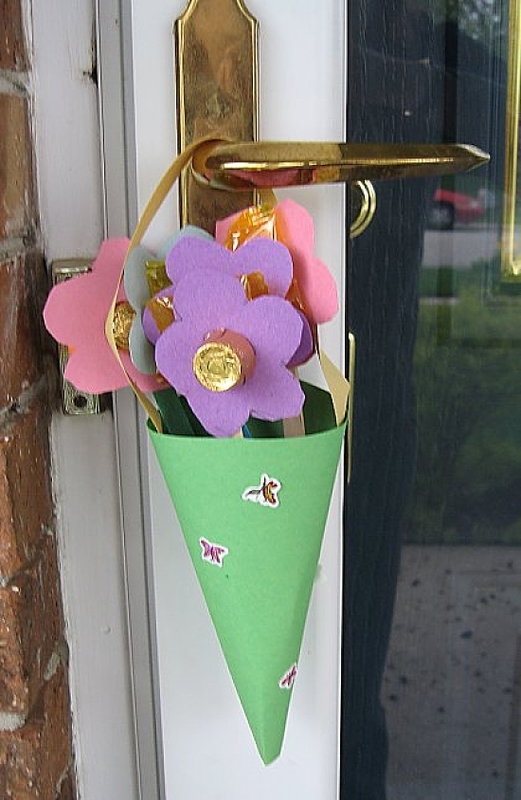 I can’t remember how many years my school allowed us in art class to make May Day baskets. I think I remember at least two somewhere between second and fourth grade. We folded construction paper into a cone and attached a handle. The teachers told us to take them home and fill them with flowers. Then we were to hang them on the door of someone we loved, ring the doorbell, and run away. The origin of my flowers has faded. I do remember that in my yard we had lily-of-the valley, lilacs, bleeding hearts, and…dandelions. I think there may have also been violets, but I’m not certain. I came home after school, picked my flowers and crossed the street to Mrs. Goetze’s front door. It was so much fun. I remember running away, but not so far that I couldn’t see or hear anyone at the door. She opened the door and looked around, saying things like, “Oh my! There is no one here. Who rang the bell? 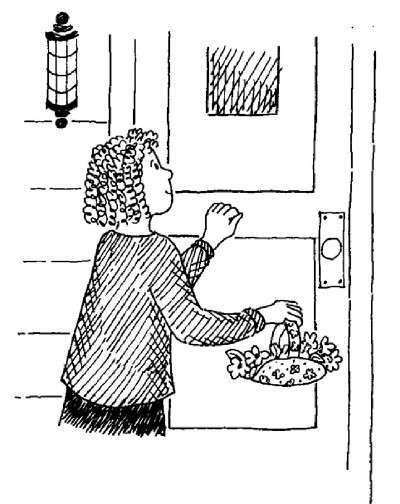 ” Then she would spy the “basket” hanging on the door handle. 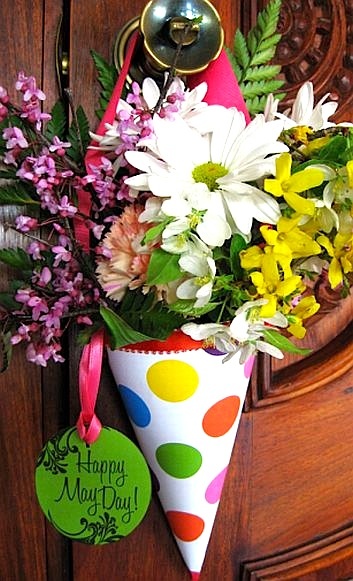 “Now who could have left these on my door? I have no idea. Thank you, whoever you are!” At least in my memories that is something like the way the script ran. I remember how good it felt to have my love recognized by somebody. During my high school junior and senior years, Mrs. Goetze became bedridden. I don’t think I actually ever knew what happened. She had a live-in caretaker by the name of Clara. Clara took one evening a week off work. I was asked to stay with Mrs. Goetze until Clara returned. Mrs. Goetze was already in bed for the night when I started that job. To my shame, I remember avoiding going into her room to talk with her. I looked in the door from time to time, but I never entered the room to even check whether she was still breathing. I think I remember most of those times that I did think she was sleeping. She slept a lot by that time. To my memory, at this point she now scared me. Actually, she didn’t scare me. The thought of having to deal with death scared me. I had no idea what I would have done if I had been more involved and she had actually taken her last breath while I was there. By the time I was in high school, I had experienced enough death in my family that I knew I didn’t want to lose anyone else. I purposely distanced myself from people I thought would die. The woman who I loved was the woman of my early elementary school days, not this old body in the bed. I tried to hold on to that earlier Mrs. Goetze, but it became harder and harder. I remember feeling relieved when I no longer had to spend Wednesday evenings in her home. I finally visted the blog site of one of my occasional commenters Tuesday. It’s an unusual site. He calls his site The Other Gardener but then writes as The Underground Lady. He is currently on page 40. I don’t have a clue as to how to get back to page 1. His thoughts are short paragraphs and eclectic. His background is black and his writing is white making it a little difficult for me to read. It is soon obvious that he is highly intellectual and well-eduated. The reason I am mentioning this is that he has the following phrase at the top of his page. Cave ab homine unius libri. It is Latin meaning beware of the man with only one book. I had to google it to get the full meaning. My high school Latin failed me. I couldn’t put it all together. I got man one book. My thoughts immediately turned to those of religious extremism who believe only one book has all the answers. As far back as I can remember, as a very young child, I was haunted with questions about why only Christians could get into heaven. I wondered about all those in the world who had never heard of Jesus the Christ. I wondered about all the babies who never had a chance to learn. Instead of being comforted by the thought that as a Christian I didn’t have to worry about where I would end up for eternity, I was discomforted about the thoughts of the trillions of other souls who wouldn’t be up there. My religious upbringing caused me to have more questions than perceived answers. My religious life was one of traveling from one Christian church to another and another during my 20s and 30s. None of them gave me satisfactory answers. For about twenty-four years I became unchurched. Since I live at ground zero within the Southern Baptist world, I’m certain many of my co-workers and neighbors considered me close to being a heathen. It was not that I was a non-believer, it’s just that I could not begin to find any answers among those who considered themselves religious. I became exceptionally leery of those who deemed themselves ministers, who held the Holy Bible in one hand and thumped the air or the pulpit with the other proclaiming that this (referring to the book being held) was the ONLY answer. Believe in this [the book] or find yourself in hell. Now that was comforting. Devout extremist Jews believe that of the Torah, Muslims, of the Qur`an. I am not familiar with extreme Buddhists or Hindus, but perhaps theirs is the same story. I have come to a belief that has been forming most of my life, that there is more than one path to God. I have found a like-minded community in which to pursue that belief. My belief in God is stronger than it has ever been in my life. What has been so enlightening to me and a puzzlement as to why it hasn’t been to others, is many of the great spiritual teachings have so many core thoughts that are exactly the same. In many ways, they mirror each other. I cannot understand why those with extreme views cannot or will not sit down with those of other faiths and explore their commonalities and form bridges with those ideas rather than to exclaim their differences and build even wider moats to surround their own island worlds of the ONLY answer. The lives of Jesus and Buddha who preceded Jesus by 500 years, are remarkably similiar. The things they both said are almost identical. These sites are only those on the first page when I googled Jesus and Buddha. Many such comparisions can be made of the thoughts of the Holy Bible and the Qur’an. They both share, along with the Torah, the same stories of father Abraham, Adam and Eve, etc. The Qu’ran mentions Jesus in several places. One of the most difficult passages for me to understand as a teenager at Bible camp was 1 Corinthians 13:12 KJV. That was the only version we were supposed to read. “For now we see through a glass, darkly; but then face to face: now I know in part; but then shall I know even as also I am known.” I couldn’t get my thoughts wrapped around seeing through a glass darkly. The minister conducting the Bible study was not much help when I questioned him. I soon got the idea I was just supposed to saw off the top of my head and let him pour the lesson in then close my mind again. In this verse, Paul tries to express the imperfection of mortal understanding. Perhaps we don’t understand because we have only parts and not the whole. Isn’t it time to start putting everything together? To see into [not through] the mirror [glass] fully and completely our reflection in the way that we reflect God? To stop seeing dimly [darkly] but in the bright light of clear day? Terrorists and extemists are the same regardless of which religion they proclaim. I firmly believe that you cannot “save” someone by beating him or her over the head. You take the child’s hand, and gently lead by example the way that should be gone, and you can take any or all paths to get there, wherever that path may lead. But beware of the man with only one book. Following in those footsteps is like watching a movie with one eye covered and only a slit in the cover of the other eye. It is impossible to see the whole grand picture. Perhaps each different religion has only one chapter. I believe it is time to combine all those chapters into one big book, editing it out so each story is only repeated one time. Perhaps then when we read it without blinders and eye patches, we will be able to at last see the big picture. I was being lazy this morning. I thought a blog had already posted so I wasn’t concerned. I checked to see and…alas…no new blog. Then I realized that I did have another blog, but I had set it to publish on Sunday. It’s more of a Sunday topic type blog. So….here goes. I have another WOW (wise older women) luncheon today. It’s my once a month get together with some friends. Sometimes we have ten or more, sometimes there’s only three of us. The problem with meeting with older women is that things happen. It’s not the same group every time. Last month there were six of us. The month before the group was larger. There’s something else going on in town today so we may only have the three of us. One of the women for several months last year was in a nursing home with pneumonia. I thought maybe she would remain there, but she regained enough strength to return home. She has COPD and must carry an oxygen tank with her wherever she goes, but she is determined to go. She is in her 80s and is a tiny woman. I fear for her safety when the wind is strong. She has difficulty hearing, so she misses out on much of the conversation, especially when the restaurant is noisy, but she still keeps coming. Her body may be becoming weaker, but her spirit is strong. She still insists on being part of the world. I admire that. She has developed a good relationship with the “leader” of the group…the woman responsible for setting up the restaurants every month. That woman is very kind hearted and will do whatever she is able for anyone who may need help. Perhaps it is from years of practice being a minister’s wife. That was during the age that congregations hired “two for the price of one”. They made certain that the minister had a wife who was highly involved in the activities of the church…of course, without pay. I was very young when the minister at my childhood church was hired. I remember that his wife somewhat broke those “rules”. I often heard criticism of how “standoffish” she was and how little she participated in church activities. Women of the congregation can be so critical of those who don’t live up to perceived roles. My friend is not like that. She does get involved in the lives of others. However, I’m guessing she does it out of a desire to serve rather than feeling pressured to do it. I have never learned the boundaries between friendship and predatorship. In an effort to not “intrude” and take advantage, I don’t perhaps seek help from others as often as I could. My friendship with her is like that. I try not to take advantage of her. She did do me a couple of favors two years ago. The train station is about seven miles from my house. I needed a ride and she agreed to take me. I rode the train up north and then flew back home. She was also at the airport to pick me up so that I wouldn’t have to take the commuter train back to the same train station. Thank goodness for cell phones. I called her when I deboarded and she was on the way to the airport. However, it was the wrong one and she had to double back a couple of exits to reach DFW! Somehow we had not communicated clearly. Fortunately, she’s the type who easily forgave the miscommunication. I guess my problem with allowing friends to help is that I seem to have friends who have other family and friends. I am very seldom ever asked by anyone else to do favors for them. That makes me feel uneasy that I am taking without giving. It’s not that I need help every day or every week, but when I do need help my first course of action is to try to figure out how to do it myself. I guess that’s from having to do it myself most of my life. I’m still working on it. Come warm yourself in front of my cozy attic fireplace. It certainly continues to be cold this winter. Even though to some, the 21° that greeted me when I let Ri-Leigh out this morning may seem warm, it certainly was a shock to me. I am very unfamiliar with continuing temperatures like that, having lived down here in Texas for 32 years. My Sunday discussion group will be finishing up the book Synchronicity by Joseph Jaworski next Sunday. We have been with it for a while, so in order to move on to the next project, we each volunteered to present a chapter in summary accompanied by any observations we might have. I chose to do the epilogue. The last page held a story which seemed to me to be very relevant to my life. There was a documentary made of the horrors of Auschwitz (WW II German concentration camp). The surreal images showed all the inhumanity of that place. I was very moved by that story. In the first place, I could identify with the story literally. At the end of my driveway I have (or may have had) a beautiful yaupon holly tree. It had already been planted by a former owner when we bought the house. I stood in front of it with my year old son for a picture. I was at least 1 1/2 feet taller than the bush. Over the past thirty-two years I have watched it grow through blistering hot summers to rise to about fifteen feet tall. It didn’t seem to need any care other than trimming all this time. From time to time I would think about that picture of us and compare the growth of the holly to the growth of my son and all the friends he made along the way. Last week we had our major record-breaking snow. The thought of my yaupon holly never crossed my mind. When I awoke the next morning, I thought my tree looked beautiful draped in snow. It didn’t occur to me how heavy the snow was upon her branches. It didn’t occur to me to go out and shake the snow off the branches I could reach. It occurred to me to stay inside where it was warm and I was safe from slipping on the concrete driveway. I looked out later in the day and gasped. My beautiful yaupon holly had four branches touching the ground or just hanging there broken and swaying gently back and forth in the very mild breeze. When I read that passage in the book, I realized the 3,741,953rd snowflake must have fallen on each of those four branches with their almost 3″ diameters. And I had done nothing to stop it. I asked the tree’s forgiveness. She looks so different with so much space between each of her remaining branches. 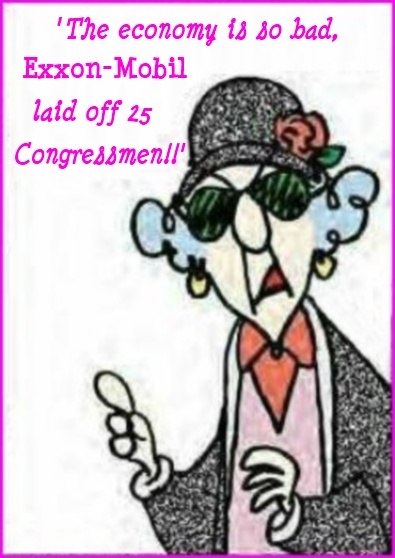 She doesn’t look nearly as beautiful as she did a couple of weeks ago when she was the envy of Maxine and Dee’s husband. The branch ends are still splintered evidence that I did nothing. They will remain that way until I find someone to trim them back. I haven’t decided yet whether to cut her down or hope that Mother Nature will heal her wounds as best She can. Maintaining peace is like that. We must all be consciously aware of the snow falls in our lives. We must be diligent about doing what we can to keep that last snowflake from falling and causing such destruction.We must be diligent because we prepare for storms. We are often caught unawares when they slowly creep upon us like the gentle falling snow last week. But we so seldom think about what we can do and must do by ourselves to save anything or anyone when the snows hit, especially like they did ever so gently in the story. I, like almost every other human being, have survived many snow falls in my life. I think I would have been comforted to have someone around to “shake off the snow” as I grew so I would not have lost as much as I have. There are parts of me that are still ragged and have yet to be trimmed. However, having said that, I must also add that I am beginning to realize in my sixth decade of life, that that is no excuse for me, as a power of one, to not speak up when I see snow clouds approaching and tell others to be diligent so that they may help prevent the 3,741,953rd snow flake from falling onto others. Somaly Mam, Mother Theresa, Florence Nightengale, Eleanor Roosevelt, Sister Kenny and so many others have been out there during their times shaking the branches they see. They serve as beacons for others to follow and do as they did. When am I going to realize that I should do the same and then actually do it? When am I going to speak up? Or…looking at the situation of peace as the dove did, maybe I’m the 3,761,953rd person needed, just one more, to tip the scales in favor of peace and stop forever the horrors of war that humans insist upon playing out. Or maybe it might be you. Good morning! Church day again! Geez time is going faster. It seems the weeks are flying by. It’s like every other day I’m saying “time for church”! That’s OK. I find I look forward to church now, after being “unchurched” for more than twenty years. Maybe I just got tired of going it alone and wanted to find like-minded friends to walk with me for a while along my spiritual path. I’m in a class where we have wonderful discussions about a wide variety of books. Currently it’s an Echart Tolle book. We’ve covered so many authors since I started going there four years ago and so many topics. When I started, the “group” had just begun “A History of God“. Karen Armstrong has written over 1,000 pages starting with the pagans up to modern times. There is a 97 minute video on the internet. If you are interested in the history of God, it’s a good way to deepen understanding in this, to me, fascinating topic. She covers details I don’t ever remember learning in Sunday School. There weren’t very many of us in that class. I think we aveeraged three per class. I felt I had completed a college level course by the time we finished, but I stuck it out. It was worth it, however. With our next book more people started to come back. After our class, we gather in the Fellowship Hall to talk with others over coffee and then we go to the service where there is sure to be a positive message to encourage us throughout the week. I like the way our service is upbeat. We are not drowned out by mighty pipe organs. We often sing songs where it is perfectly allowable to move to the beat. The choir and the minister don’t wear robes. There is no pulpit. No one is “Mightier than thou.” There are no ritual prayers. Yes, we all know that in our daily lives we do things that are not “right” by social or church standards. However, we do not dwell in guilt about it. We recognize it and try not to repeat it. We say that “sin” is close to its original meaning of an archery term of “missing the mark”. When we act in a way where we are missing the mark, we are separating ourselves from the love of God. One phrase I heard often throughout my life is “I’m not worthy“. Scroll down this link and view how this poet views life. I no longer feel that way. In my own mind, it is an insult to God who created us in his/her own image to say we are not worthy of forgiveness. Aren’t I saying that I am less than deserving of the love You put into Your own creation? When I realized I AM worthy of God’s love and forgiveness and stopped feeling guilty 24/7, I started to heal. God LOVES me. S/He doesn’t condemn me. That’s a powerful understanding and I don’t think it is being egotistical. These are the understandings I have come to know in my present church. After the service, it’s back to the Fellowship Hall again to talk with others and another cup of coffee or a visit to the bookstore. Sometimes some of us go out to lunch afterwards. When I first started going there, a large group gathered every Sunday at different restaurants around town. Then numbers began to taper off but the smaller group continued. Then it wasn’t every Sunday. Now it is occasionally. I miss that every Sunday routine. It beats coming home by myself when I feel I want to socialize some. We all seem to be making other plans for our Sunday afternoons. That’s too bad. I can’t complain, however, because I am not willing to be the co-ordinator and arrange with different restaurants accomodations for our group. The man who was doing that found it time consuming and moved on the other things. One reason it is so difficult for us to get together on a regular basis is that our church kind of celebrates that getting us involved in activities is similiar to herding cats. Our church kind of attracts free thinkers who may or may not participate on any given occasion. Some of us are warm and cuddly. Others of us are more reserved. Then there are the group of us who used to be reserved but found so much love, affection, and acceptance that we’re getting cuddly too. I don’t ever remember anyone in the church of my youth hugging. The men would shake hands. The women would just stand there and nod acknowledgement. Now, it is a given to get at least ten hugs each Sunday morning. I have been there long enough to realize people are cycling through. They come for a while and then disappear only to return again. There is a core group that seems pretty stable, but most of them are not the single ones. Cats are such individuals. We definitely view ourselves differently from sheep who tend to be of one mind and flock together into easily manageable groups. My goodness. My church was not even the topic I was going to discuss today. I guess it’s just that I’m seeing my life change in such positive ways that I sometimes get overly enthusiastic in my desire to share. I know some people are really turned off by this topic. I apologize if my views have offended anyone. There are certain friends that are very fundamental in their beliefs with whom I do not share any of my thoughts. Hi. Welcome to my front porch. I’ve given up the attic for a while in favor of cool enough mornings sitting outside while the porch is in the shade. Did you ever think about the number of people who NEVER just sit outside to relax? I’m venting today about my lack of ability to comprehend all things mechanical, technological, chemical, or physical. Among some people I am considered intelligent, I guess based upon my writing ability, and the fact that I am a fairly decent speller. It always amazes me when that observation is made. When it comes to anything else in the world, I view myself as a completely helpless individual…or at least I used to think that way. I got a new red bicycle for my tenth birthday. About three years later I decided the paint wasn’t bright enough any more. I completely dismantled it by myself in the garage in order to paint the fenders properly. Why I thought that had to be done, I’m not sure. Anyway, I painted the bicycle parts bright red enamel. I can’t remember how I got my hands on the paint. Then, I was stuck. I did not have a clue as to how to put it back together. Instead of asking either of one or two mechanically inclined uncles living within yards of me to help me re-assemble it, or trying to help me himself, my father loaded the parts into the car after three days and took it to a distant cousin for her husband to reassemble for their daughter. I just said, “I can’t put it back together. Do with it what you want.” End of story. End of bicycle. Of course I cared. I just didn’t know how to say it. I found the older I got, the more helpless I became. Because my father hired a housekeeper/child minder when I was four, and because I was frequently ill with asthma, headaches, and allergies, I was never expected to do anything for myself. My aunt would bake but only when I wasn’t around. When you don’t do anything for yourself long enough, you learn either you don’t have to because others are better and faster at it and don’t expect you to perform, or you are not able to help yourself in the first place. It’s called learned helplessness. I found three very interesting articles about this topic you might want to investigate if you feel the same way. I apologize for all the long links. I’m still trying to learn how to hyperlink. I now have realized this “learned helplessness” was my main reason for not making it through nursing school. I was like the dog in the article. I had been shocked too many times with no way to control the situation. I had no confidence in myself. There was no such thing as self-esteem on my horizon. I can identify with the person in the above picture. Although I would cover myself, I have been in this state many times in my past. My favorite fetal position. I have come a long way in my thinking of my abilities since joining the church that I now attend. The church has five principles. Two of which apply to this blog. Now I’ve had trouble accepting this principle. One of the criticisms of this principle by fundamentalists is that we DARE to put ourselves on the same level as GOD. How can we be so bold as to think so highly of ourselves? I can actually have some control over reality just by the way I think? I didn’t think so. It is of considerable significance that, in the middle of this description in Psalms 104 of the working, creating God, there is a reference to human labor. Verse 23 reads, “Man goes forth to his work and to his labor until the evening ” (RSV). The Bible suggests that human labor must be seen as part of God’s ongoing creative activity. By our work, we become co-creators with God! This is an essential part of what it means to be truly human.Whether we are a marketing person for a computer services company, a lab technician, a production manager for a biochemical firm, a homemaker, a weatherman, a school teacher, or a doctor, in our work we are co-creating with God. We are contributing to God’s continuing work of sustaining creation. This gives our work tremendous significance in God’s sight. 2. Through thoughts, words and actions, we live in the truth we know. In my book discussion group we have been studying two books of Eckhart Tolle. The first one was The Power of Now and the one we are reading now is the same one Oprah discussed with him, A New Earth, Awakening to Your Life’s Purpose. They are not easy at first to understand but when it starts to sink in, what he says really has the capability of changing how I view myself in the world. All I have is right now, in the present. I can do nothing about the past. I no longer have to hold onto the beliefs which have previously shaped me into what I am today. I am a capable, loving, sharing person who has strong beliefs in what is right and not right for me. I can stand up for myself and do for myself. If I don’t succeed the first time, I do not have to call myself stupid. I just have to want to try again, if that is what I choose. That is MY truth. I am capable of doing many things I never used to believe of myself. Oh, what brought about this topic? I have a three handset V Tech 5.8 GHz digital answering system. The first one I bought started acting crazy after several months so I took it back to the store and got a new replacement set. Now this one, a year later, is performing in the same way. I can’t make or receive calls because I get the message that another handset is on or I am out of range when I am within two feet. After checking and rechecking and switching and reswitching handsets and letting the darn things rest, at least the one on my desk is now functioning again. I am expecting some important phone calls and I think I can leave and the answering machine will work. As to the other two handsets, the message still says another handset is on or I’m out of range. The WILL NOT let me connect to the world. I am not helpless in solving this problem. After talking with my neighbor, her relative experiences the same thing. The darn things won’t hang up properly.